Alwyn Hamilton, a Canadian best-selling author, pens a gripping and powerful tale laced with love and magical powers in her new YA fantasy story, Rebel of the Sands which marks as the first boon in an exciting new fantasy series with the same name. This story is set across the golden sands that harbors both common people and mystical beings like djinnis and horses and it is centered around a young girl living in a town, who wants to escape her boring and dull life by using her shooting skills. Amani, a young teenage girl with sharpshooting skills is bored of her life in a dead-end part of her country, Miraji and she is desperate to get the hell out of this town, where women had almost zero respect or stand in the society. Thus she impersonates as a boy to enter a shooting competition and that is where she meets a fugitive on the run, Jin, who seems like her escape route from this town, and when a tragedy strikes the town, she needs to make up her mind to trust this criminal in order to rescue herself. Walk on Earth a Stranger by Rae Carson is the book which had already portrayed a story similar to this one, where a girl with so much power, wanted to escape her life by impersonating as a boy and falling for a boy who helped throughout her challenging journey, thereby falling for one another. And similarly, it too had a Western theme, featuring cowboys and rebels with guns. 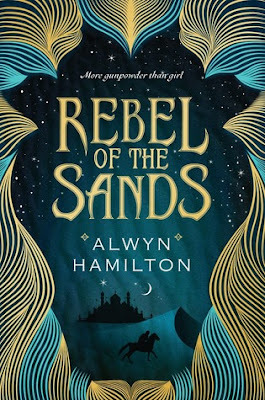 Whereas Alwyn Hamilton tries to arrest that Old Western theme with the help of Middle-east Arabian Nights fantasy setting. Well, to be honest, same kind of theme and story line feels bit a monotonous to read because we, readers, expect some uniqueness of the stories. Moreover, this story lacks drastically in its genre of fantasy, as there is not much magic or fantasy stuff in the story. Moreover, when the synopsis promises that there is a thrilling road-trip, all it was found that a dull journey through the deserts and some not-so-risky challenges and with a lot of making out between the two main characters. In one word, it is plain boring, nothing to expect or anticipate about! No doubt, the author's writing style is quite articulate and has been laced with suspense. The narrative is bit boring and the readers are bound to lose interest from the story. The pacing isn't so fast or moderate, but almost near the end, the story picks up speed and that is where the readers will be bound to stay focused with the story. The characters are bit cliched, as the heroine, Amani is a badass teenager who is rebellious and does things that she isn't supposed to do as a girl, she longs for freedom and very predictably, she never had a set of parents to get love from. She is so wrapped up in her aim to get out of the town, that she doesn't pay any attention to Jin's charms. But eventually they fall for one another with a bit of passion and emotions. The supporting characters are okay. Overall, this book is not that promising enough to keep the readers engaged or excited for the whole series. There are far better YA fantasy books out there, and you can easily overlook this book. Verdict: A very bland story. Courtesy: I received an e-copy for review purpose.